The TaylorMade M2 irons are probably one of the most popular irons on the market right now. These things are flying off of the shelves. Part of that is probably due to the relentless marketing that TaylorMade is brain washing us with. But the other reason is that these irons really are the best cavity backs available. If you lack a bit of experience playing golf, these are the best golf clubs that you can buy. These clubs are a great option for golfers ready to move beyond their first set of off-brand clubs. The TaylorMade M2 golf clubs are designed to get the ball into the air, to fly straight, and to fly far. They are game improvement clubs that are intended to make the game easier and more enjoyable for more people. If you’re ready for a new set, but want a lot of forgiveness in your set of golf clubs, these are the best golf clubs for you. Not to mention, these golf clubs are very affordable when compared to their competition. What Do The M2s Do? One of the basic challenges that most golfers face on the golf course is getting the ball into the air. Getting the ball to fly high is a critical element of maximizing distance and landing the ball softly on the green. If you can’t get the ball in the air, you’re not going to have fun on the golf course. However, hitting the ball high is easier said than done. You can’t expect to step onto the course and immediately hit a towering 9-iron 140 yards. If you make poor contact with the ball, or if you have a low swing speed, you may find that it’s difficult to hit the ball high enough to maximize distance and attack your targets. This is exactly what the TaylorMade M2s are designed to help you with. But remember, nothing will improve your game like understanding and implementing sound fundamentals. Don’t expect miracles out of inanimate objects. Ultimately, you are responsible for your own golf swing. These golf clubs will simply help you play better golf by not penalizing you for poorly struck shots as much as other golf clubs will. They will not magically help you swing play really good golf. With that said, lets get into the specifics. These should be considered distance irons, as it is plain to see from their design that they are meant to help you hit the ball far. The weighting of these golf clubs is designed to get the ball to fly high into the air- a critical element of distance. They also feature large cavity backs on the clubheads, which maximize forgiveness. When a club launches the ball high and reduces the negative effects of mishits, you’ll hit the ball farther and straighter more often. These golf clubs feature face slots that make the clubhead more forgiving by preserving ball speed even on mishit shots. 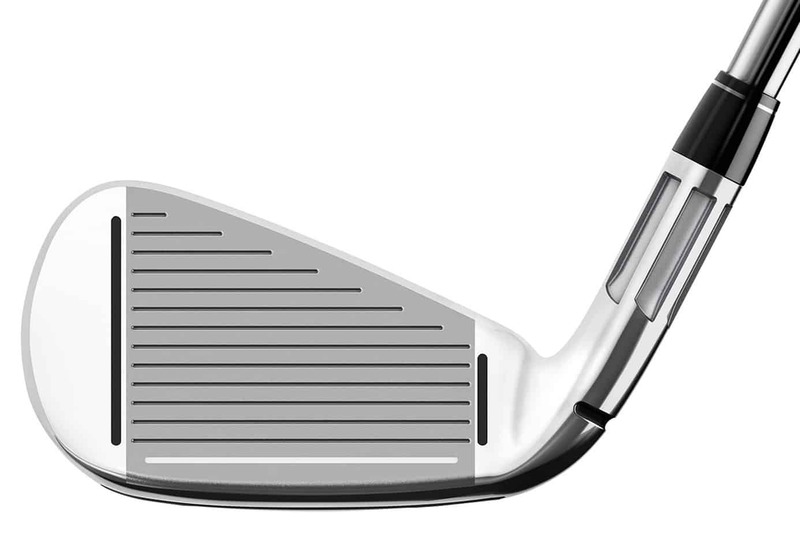 This face slot technology is a new addition to the M2 line of golf clubs and golfers love it. It is amazing to see the subtle details that go into modern club designs. Thanks to the technologies that are available today, club designers are able to dissect the importance of each specific element of a club, and then refine that element to make sure it is living up to its potential. A great example of this concept is the fluted hosel on the M2 irons. If you look closely at the hosel of the M2 irons, you’ll see the fluted technology. Essentially, this means that material has been taken away from the hosel portion of the golf club to reduce its weight. It is estimated that the fluted design saves a total of five grams whem compared to a traditional hosel. While that might not sound like a lot, every little bit helps when trying to lower the center of gravity and increase the trajectory the golf ball. The M2 irons are distance irons. Because of this, TaylorMade has used strong lofts for these golf clubs. This means that the typical degree of loft used for a nine iron may be used for the pitching wedge. While the length of each club won’t change, the degrees of loft will. This will allow the golfer to hit each club further. For example, the loft on the PW for the M2 golf clubs is just 43.5’’, which is low by pitching wedge standards. However, the design of these golf clubs launches the ball high into the air, so you won’t have to worry about hitting line drives. Instead, a lower loft can be used and additional distance can be achieved. 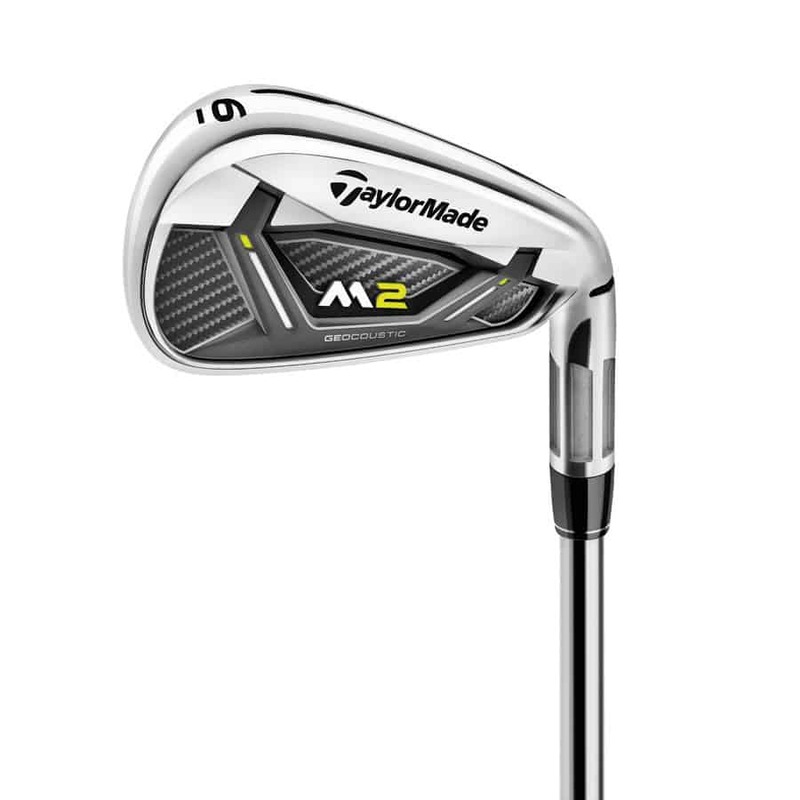 The TaylorMade M2 irons are the best golf clubs on the market for golfers looking to buy a nice set for the first time. They are forgiving, launch the ball high, and maximize distance. All of these characteristics help golfers that are starting to play golf more regularly but haven’t lowered their handicap significantly. Without question, these are the best golf clubs on the market for entry level players.